And sparks are still there--crackles; the loopy, off-kilter guitar solos; the shrill, childlike cries from atop the playground slide; the girl/boy call-and-response, sometimes a conversation, sometimes a poem; the stark silences, the smoldering rumbles, the rampant howls; the beat that began in your ears as an infant, so constant now that you don't even here it except when it's played. And, if just for an instant, Michelle doesn't know what's in the shot she just drank, and she's surprised--and they're kids again: Coming home from school and telling stories about road trips across Mexico, about the magic of just being, and about how, above all, it's our turn to take the stage, and take what's ours, Today, Today. We have something to share with you--it's only fair to let you know. After the show on Friday, March 28th, 2008, Luigi will be frozen in time, rendering us unable to perform any more live shows. We can't say it'll be the last Luigi show EVER. But--we know with certainty--it will be the last for a very very long while. Please keep in touch with us at this web site or myspace.com/luigi. There you'll also find links to other endeavors of Luigi members Brian Fletcher, Scott Rowe, Jeff Holt and K. Michelle DuBois. Luigi is happy to be headlining the second annual Mr. Noheart's Un-Valentine's Day show this Saturday, Feb. 9th at Lenny's. 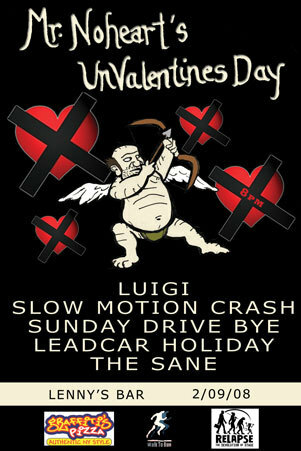 Other bands on the bill are: The Sane, Leadcar Holiday, Sunday Drive Bye and Slow Motion Crash. This is a really cool event put together by Walk to Run productions and we're excited to be a part of it. There will be plenty of surprises and extras going on throughout the show. We can't get too specific, but trust us, it will be a lot of fun. This show will also be our first without Brian, as he takes some time off from live shows to focus on his new twins (Jack and Nora). Filling in for Brian at this show will be our good friend Jeff Sullivan whom you may know from a little band we like to call Drivin' n' Cryin'. Thanks for helping out, Jeff! 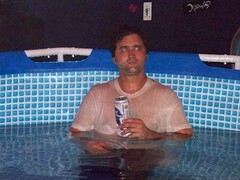 Johnny after our recent show at Lenny's for the Other Sound festival. Pool courtesy of Club Awesome. Here's what Corndogorama does to Luigi. We love it. Scott's other band, the supergroup Badd Magick Number, has a nice interview in Pine Magazine. Check it out! Quick note here that Luigi is going on at 9pm sharp, Friday, July 13 at Corndogorama. See ya there! The show starts promptly at 9pm when Parade hits the stage. They will be followed by The Jupiter Watts at 10pm and yours truly at 11pm. We love you and can't wait to see your lovely face. 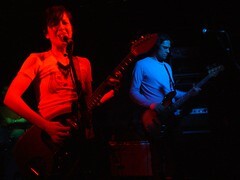 Don't forget, we'll be playing tonight at the EARL with Silver Lakes and Mary O Harrison. See ya there! Here's a review of our January show at Lenny's. Thanks, Southeast Performer! Howdy, folks! Here are some photos from our recent show with the Features. We had a blast and can't wait to see you again. Thanks, Alex, for the awesome photos!